Sometimes I despair at the naivety of politicians. Theresa May's humiliation in Salzburg was an inevitable consequence of her belief that the EU would be willing to compromise its "four freedoms" to keep her in power. To be fair, press reports since the Chequers plan have suggested that the last thing the EU wants is a change of leadership in the UK. But it was a mistake to interpret this as meaning the EU was willing to become Theresa's poodle. Nothing could be further from the truth. The EU has said many times that the four freedoms are not up for negotiation, and proposals that tried to keep some of them while rejecting others have all been flatly rejected. Theresa's prized Chequers deal was weighed in the balance and found wanting the moment it hit Michel Barnier's desk. All the European Council did was confirm what everyone already knew. You must give me leave to flatter myself, my dear neighbour, that your refusal of my Chequers plan is merely words of course. My reasons for believing it are briefly these: — It does not appear to me that my deal is unworthy your acceptance, or that the trade relationship I can offer would be any other than highly desirable. My situation in the world, my connections with the family of De Commonwealth, and my relationship to your own, are circumstances highly in its favour; and you should take it into further consideration that in spite of your manifold attractions, it is by no means certain that another offer of a trade deal may ever be made you. Your German car makers are unhappily so dependent on British customers that failing to agree to my proposal will in all likelihood undo the effects of their engineering prowess and manufacturing strength. As I must therefore conclude that you are not serious in your rejection of my deal, I shall chuse to attribute it to your wish of increasing my love by suspense, according to the usual practice of European countries. But as Jane Austen repeatedly reminds us in her novel Pride and Prejudice, Mr Collins was not a sensible man. Dear Theresa, do think about how this makes you look. Mind you, Theresa is hardly the only person who is convinced that "no" is simply a negotiating ploy. If there is one thing that has characterised the Brexit negotiations from the start, it is the extraordinary confidence of Brexiters. They have told us again and again that the EU will eventually cave in to whatever the UK demands. This despite the fact that in eighteen months of negotiation the EU has not caved in on anything, and shows absolutely no signs of doing so. Why on earth Brexiters think that the bloc that took severe economic pain rather than making concessions to Greece, Portugal, Ireland, Cyprus, Spain and Italy, and has opted to fight U.S. trade sanctions at the WTO rather than give in to U.S. demands, would find British blandishments irresistible is a complete mystery. Even in the glory days of the British Empire, European countries didn't do what the UK wanted. Why on earth would they do so now? If you repeat yourself often enough, everyone will believe you, even if you are talking utter tosh. Other hardliners are no better. I await with boredom and ennui the forthcoming Brexit proposal from Shankar Singham and the Institute for Economic Affairs. I expect it to be yet more "look into my eyes while I count to 10" mumbo-jumbo. For sheer slipperiness, the snake Kaa in the Jungle Book has nothing on them. Nor does the elusive Snark, for that matter. Of course, the trouble with Snarks is that they can turn out to be Boojums. And it is not just hardline Brexiteers who may struggle to distinguish between the two. Now, these strike me as having more than a little of the flavour of Will O' The Wisp about them. Numbers 2 and 3, for example, are mutually incompatible, as the EU has repeatedly explained. You don't get the benefits of the single market unless you are a member of it, and you can't be a member of the single market unless you agree to Freedom of Movement, which of course prevents you "managing" migration, even "fairly", for national economic, social and political purposes. So here, in Starmer's tests, we have cake and cherries. This is already looking more like a Boojum than a Snark. So, they are proposing a Norway+ deal - membership of the Single Market and the Customs Union? Presumably, then, they are going to accept Freedom of Movement, since membership of the Single Market is not possible without it. But if so, why bother to leave the EU at all? No freedom of movement, then. So how are they going to retain the benefits of the Single Market and the Customs Union, when the EU has completely ruled this out unless freedom of movement is also accepted? In the longer term, we propose a new model of alignment that we describe as a ‘shared market’ between the UK and the EU. The ‘shared market’ would aim for continued alignment between the UK and the EU across most of the single market, but would recognise the potential for regulatory divergence over time. This model would have the following features. - The agreement would stipulate that continued regulatory alignment in all aspects of the single market, with the exception of the free movement of people, is required in order to access the full benefits of the single market. This would include regulatory alignment on competition-related measures such as state aid, intellectual property rights and public procurement, as well as horizontal and flanking policies, such as company law, consumer protection, employment rights, environmental protections, and gender equality and anti-discrimination legislation. - With respect to the free movement of people, there would be an agreement on ‘quasi-alignment’ – i.e. an agreement that upholds the key principle of free movement of people while allowing new controls on immigration. This could constitute a ‘safeguard measure’ that allows the UK to impose temporary controls on EEA migration during periods of exceptionally high inflows, as have been experienced in recent years. - Enforcement and dispute resolution would be carried out through a ‘two pillar’ mechanism modelled on the EEA agreement. A new UK Surveillance Authority and UK Court of Justice, including representatives from the UK and the EU, would monitor and adjudicate over the agreement. To ensure homogeneity, the UK Court of Justice would follow the Court of Justice of the European Union (CJEU)’s interpretation of single market rules with respect to case law up to the signing of the agreement, and would then pay due account to subsequent CJEU case law. A joint UK-EU committee would be created to resolve disputes. - The agreement would allow for the possibility of divergence between the UK and the EU, either with respect to existing or future single market legislation. If divergence occurred, a ‘declaration of incompatibility’ would be issued, which would initially give either side an opportunity to realign, and, if they did not, would result in the suspension of areas of the agreement. Crucially, the extent of the suspension would be proportionate to the extent of the regulatory divergence in question. The UK-EU committee would then review the suspension after a predetermined time period (e.g. six months) to monitor if divergence remained and the suspension was still necessary. - The UK and the EU would also agree a joint customs union to cover all goods. This would limit friction in trade in goods between the UK and the EU. In return, the UK would continue to align itself to the EU’s trade policy. - As part of the agreement, the UK would make a continued financial contribution to Europe and the EU, recognising the benefits that it would receive from these investments. This would include solidarity contributions (to help reduce regional economic and social disparities across Europe through a ‘UK Grants’ programme), programme contributions (to pay for programmes and agencies in which the UK continues to participate), and security contributions (to support the EU’s foreign and security policy, including both financial and in-kind contributions through equipment, personnel and operational support). In effect the IPPR is proposing a bespoke Single Market in goods, services and capital, without the inconvenient Freedom of Movement rules in the existing single market, and with the possibility of regulatory divergence over time, which is not permitted in the existing single market. It is, in short, a cake and cherries proposal that is second to none. The "bold and ambitious" Free Trade Agreement laid out in Theresa May's Lancaster House speech is merely a plain Madeira cake by comparison. If this really is the basis for Labour's "Negotiating Brexit" manifesto, it is not going to get off the starting blocks. Though of course it would pass Keir Starmer's tests. So presumably Labour - and the IPPR - think it is a genuine Snark. How could the EU possibly turn it down? They can, and they will. Creating a bespoke single market for a third country, especially one which cherry-picks the EU's treaties, fundamentally undermines the EU's single market. In effect, it gives the UK a better deal by leaving the EU than it was able to have while a member. This would not be lost on the other EU countries, several of which are also chafing at the Freedom of Movement restrictions. Suppose that Italy, for example, said to the EU: "I want to leave the single market I'm in and join the single market you've just agreed with the UK". How could the EU possibly refuse? This is not a Snark, it is a Boojum. And we know what happened to the person who caught a Boojum, don't we? 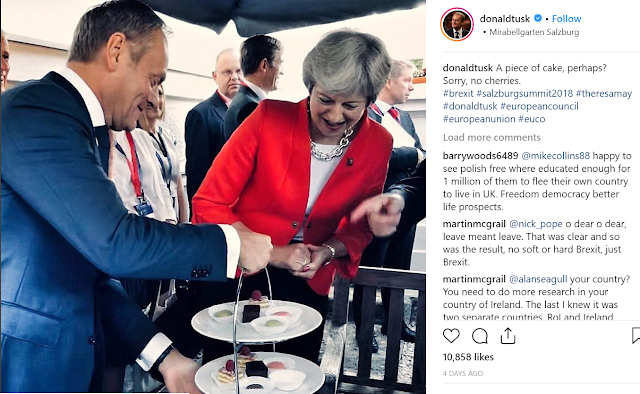 The EU knows perfectly well that if it agreed to any of these cake and cherries proposals, whether Theresa May's Chequers deal, the lunatic schemes of hardline Brexiters, or the gateau devised by Labour and the IPPR, it would softly and suddenly vanish away. Cake and cherries may be delicious for the British, but they are lethal for the EU. Even a no-deal Brexit, painful though it would be for EU member states, would be better than this. Unless British politicians, on both sides of the political divide, give up cake and cherries, the Snark they eventually catch will be a no-deal Brexit. Image is from Donald Tusk's Instagram account. Love the hunting of the snark analogy, but it needs to be extended to the EU itself. The 4 freedoms are also a snark hunt ending in a boojum, which may well end up looking like the EEA for everyone. Meanwhile the whole deal/no deal thing is a political charade designed to shape the near term electoral terrain and drown out discussion of the actual outcome. The trick is to look at everything as if you were standing in April 2018. May is using deal/no deal as delaying strategy to get over the March line with a toothless no deal which defaults into a defacto extend and pretend arrangement , which she then spins as a triumph and a platform for reelection. This puts the EU in a trap. If they put up a wall in response to no-deal (flights, goods etc) Ireland goes under the bus along with the UK (all Irish food distribution is in the UK) and the disaster capitalist brexiteers take over in the chaos. Atlantic shock doctrine capital wins, EU tapeworm capital loses. If on the other hand they leave the wall down they default onto a path giving them Chequers. That's why everyone's jostling to get an election or second vote before march. But ultimately only Tory MPs can deliver those outcomes. So the Remainer strategy is to get the brexiteers to rebel now by undermining May. The labour strategy should now be clear. Help trigger a Tory split before March, but if that fails (because it's not in their power) have a version of chequers in place (IPPR version) around which to campaign against May in a post march election. The whole post is based on the peculiar "parliamentary" assumption that the "honorable gentlepersons" are making "honest mistakes". My personal opinion is more similar to the other commenter's “political charade designed to shape the near term electoral terrain”. My best current guess is that contrarily to Project Fear brexit will be costly but not catastrophic (halving of already low GDP growth rates for 10-15 years), and that Conservative donors and MPs are far more scared of a Corbyn government stopping property price increases than of brexit. * The Conservative government makes proposals designed to be unacceptable to the EU27. * The Conservative "minority" denounce loudly each proposal as "surrender" to the EU27. * The EU27 reject the "surrender" , proving to english voters that the EU27 just want to "betray" England. Then they will campaign on a stridently jingoistic "English Nationalist Party" profile in 2022, because that got them a landslide in 2017. The Labour strategy is even simpler: as long as the Conservatives promise cake-and-eat-it, they must propose even better cake, as they are not in government and what they propose does not matter. If perchance they get into government they will sign up to EFTA/EEA, that is "the Norway option", because that is what the six tests amount to, as in theory in the EEA treaty freedom of movement can be suspended in exceptional cases for brief periods under Article 112. Excellent post - and yes Labour's plan is as ridiculous as the myriad other 'ideas'. Heaven help us but I think my suggestion on 27 June 2016 in The Economist https://www.economist.com/comment/3167457 actually had more merit - at least I had the sense to suggest: "we need to try to keep everything else that's worth keeping ...I’d suggest that includes freedom of movement for our people to live, work and retire in Europe." Clearly my idea was sketchy (and perhaps a touch Snarky) - but as a starting point (out of the political union but not much else) it made sense - and my advice to consider it "before anyone pushes the red button marked Article 50" should have been heeded.